Letterpress printed thankyou note in blind (no ink). 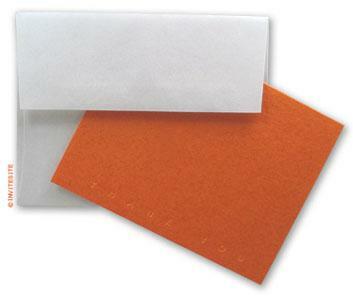 Pearlescent Italian paper and pearlescent white (italian paper) envelope. No liner. Handfed letterpress printing - on a printing press built in 1910. 'Thank you' de-embossed into the paper. Fold at top - tentfold design. Opens flat to 8.5 x 5.5 inches. Pearlescent Italian orange cardstock. Peasrlescent white (Italian envelope).